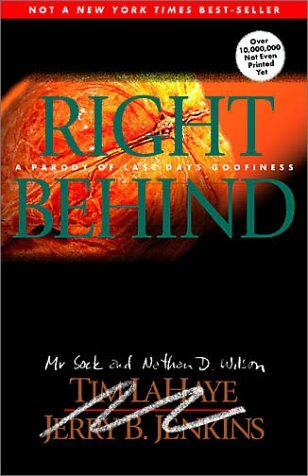 This book was written to be a parody of the Left Behind series. It had a great deal of potential and the concept was amazing, but the execution was a little flawed. I am not sure if it was Wilson's youth or inexperience as a writer that lead to the let-down. Or maybe it was having read many of his more recent books and finding his fiction, especially in the 100 Cupboards series, almost 'Tolkienesque', that I had such high expectations. Instead, I read something like a Christian version of a fraternity joke. 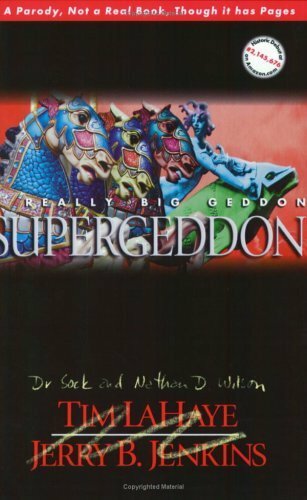 The style was a little rambling, the story inconsistent and it constantly made reference to the fact that it was an end-times book - characters referring to what evangelicals would and would not accept in the writing and also characters talking about their character and its focus or intent. Overall it was a let-down. I read it because I set the goal of reading all of Wilson's books and I will read the sequel to this but I know he could have done so much more with it if he had written it today! In this adventure, there is a new girl at school, Amy Namey. And she seems to be a lot like Judy Moody. At first Judy is jealous of Frank and Rocky's interactions with Amy, but soon the tables have turned and Judy upsets them by spending so much time with Amy. Judy upsets them so much, they stop talking to her and even refuse to help on a school group project. 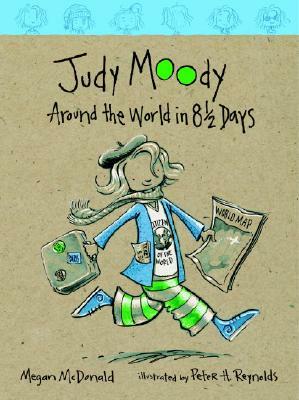 Judy works hard to make things up to them and help the two classes make it around the world in 8 and 1/2 days. I really enjoyed what Megan McDonald and Peter H Reynolds did in this book. It was different from the others in the series and as such we saw more development in Judy. It was another great read in an absolutely wonderful series. Between the two authors they have written well over 100 books for children. 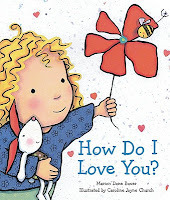 This is the first book by Marion Dane Bauer we have read, and about the 10th by Caroline Jayne Church. CJ Church is one of our favorite authors and illustrators. And based on this book we will need to track down more by Marion Dane Bauer. 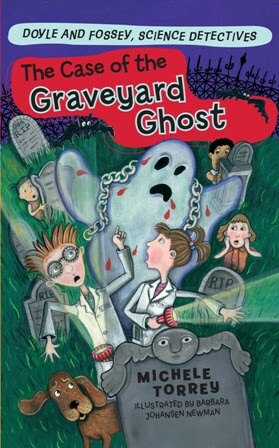 The illustrations are unmistakably in Caroline Jayne Church's style and yet they use a much brighter pallet than some of her other books. It is a wonderful little book and it will quickly become a family favorite. 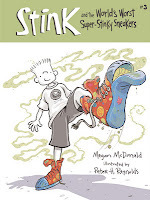 The books by Peter H Reynolds and Megan McDonald are always fun. 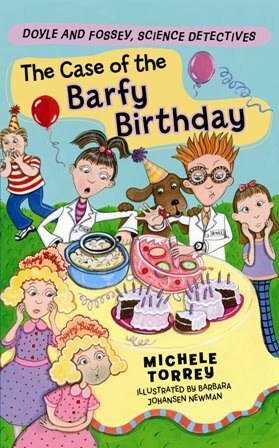 Their way of capturing day to day family life with a quirky twist is wonderful and enjoyable for both children and those who read to and with them. 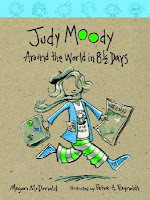 The books in the Stink and/or Judy Moody series have this year become among my favorite books for young readers. I am constantly telling people to give them a try. With 23 books between the two characters, there is a lot of fun reading to be had, and hopefully we will get many more as time goes on. This was a laugh out loud funny book that is part of an incredible series for young children, and even just for the young at heart. The cover of this book caught my attention. I had never heard of the series and thought I would give it a try. 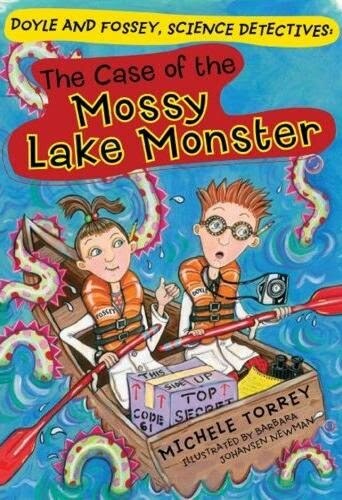 It was a good read - something I am sure children will enjoy and with 5 other books in the series, there are lots of stories to read. They use science and the scientific method to figure out problems that are plaguing the people around town, kind of like the Ghostbusters. Where there is a problem, people call Doyle and Fossey, for as their business cards say 'Call anytime'. Or read anytime for a good story. With each profile you fill in the date you obtained it and who it battles against. There is also a quick fact for each. Then there are over 100 stickers. 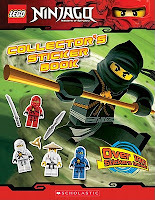 Finally, there is a series of pages for you to use the stickers to create battle scenes. The only thing that would make this book better would be if the stickers were the reusable decals. But all in all a book children will love. I can only state that with every Judy or Stink Moody book that I read I love the characters more and appreciate the authors more. These are amazing books and in less than 2 months I have read over 20 books combined across the two authors. Megan McDonald has an amazing gift as a story teller for capturing family life and putting a humorous twist on daily life. 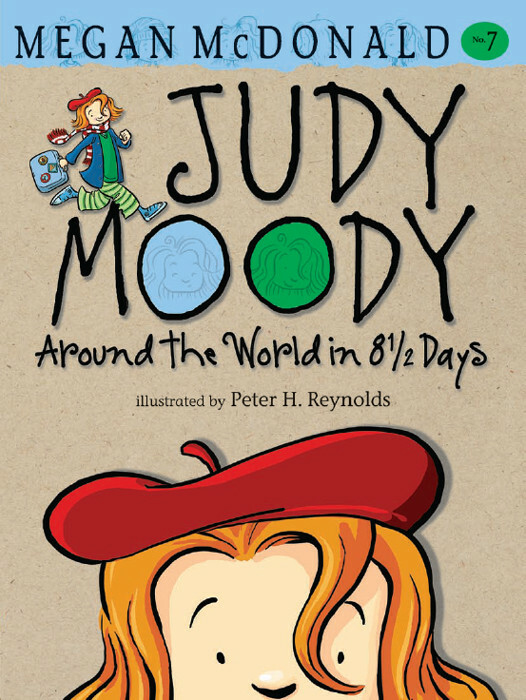 Peter H. Reynolds is an incredible illustrator and story teller himself and his illustrations add a wonderful dimension especially to the Judy and Stink Moody books. I have been recommending these books to everyone I know with kids between 5 and 15 and so far everyone who has tried them has loved them. These are books I cannot wait for my children to be a little older so I can share with them, and that is the highest praise I can give. 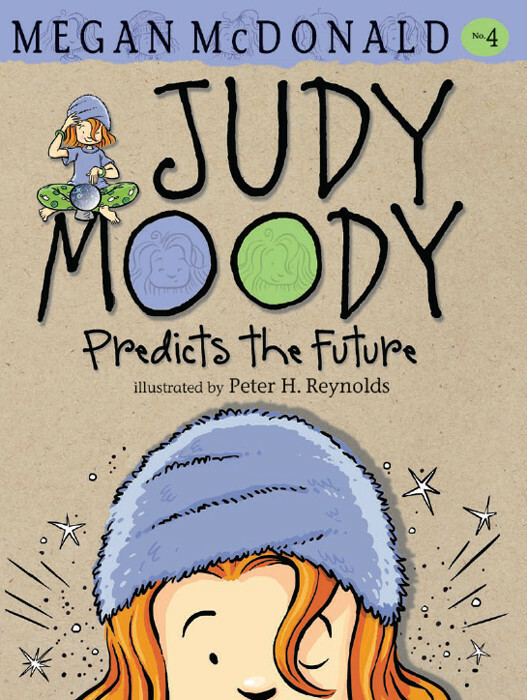 In this book Judy tries to trick Stink by predicting the future. 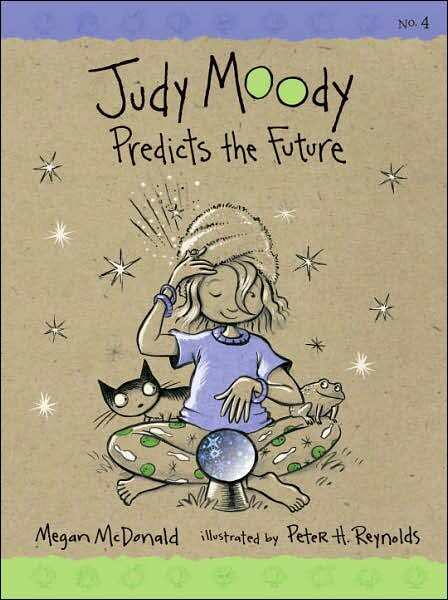 But soon much of what she predicts comes true. Then at school, she makes a boast prediction and it does not come true. As we can expect, this puts Judy Moody in a mood. But as she tries to figure out what is going on with her teacher and the artist that is visiting the school, she realizes sometimes you can figure things out before they become public. 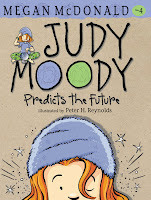 In this book, Judy gets her first mood ring, Toady comes back and is more fun than you can imagine. It was a great read in an amazing series. Dave Armstrong is a man of many talents. He is an apologist, author, speaker, researcher and many more. I encountered his writings a number of years back while doing a Religious Studies Specialization in Roman Catholic Thought. I have always been impressed by his style, his books are written with great academic rigor and yet easily accessible by the layman. He recently took some time out of his busy researching, speaking and writing schedule to answer some questions for us. 1. If you had not become a writer and apologist what do you think you would be doing for a living? I have no idea what other serious (i.e., skilled) career I could have pursued. I have known I was called to apologetics in some capacity since 1981, when I was an evangelical Protestant. Prior to that I had many career ideas: none very definitive. Yet I did have sort of a "second career" as a delivery person in several capacities: quick delivery of small packages and a route in which I delivered payroll to companies. I did this (quite enjoyably) for ten years: from 1991 till 2001, when the company I worked for went out of business: at which time I began full-time Catholic apologetics, almost by default, in a "nothing to lose" scenario. What else was I to do at age 43, with four children (my fourth had been born two weeks earlier)? I gave it a shot (making my situation known on my website), and it has worked, though I'm in no danger of cracking the Fortune 500 anytime soon. 2. How did you go about pursuing your career as a writer and apologist? From 1981 I started spontaneously writing short tracts, defending and sharing evangelical (Arminian) Christianity. In particular, I was trained "on the spot" at the Ann Arbor Art Fair all through the 1980s (near the University of Michigan campus). From 1985-1989 I was a campus missionary / evangelist (University of Michigan-Dearborn and Wayne State University): supported (well, theoretically . . .) by my own churches, but mostly by friends. That collapsed in 1989. I was 31, disenchanted, a seeming total failure in my chosen occupation and most important goal in my life, and in a sort of existential crisis: not knowing what my future held in store, since all I really cared about was apologetics and evangelism. But God had plans for me; something I couldn't anticipate at all was about to happen. Within a few months I started pondering Catholicism, as a result of some Catholic friends, who were vocal participants of an ecumenical discussion group in my home. By October 1990: exactly a year after the demise of my campus ministry, I was persuaded of the truth of Catholicism, as the fullness of the Christian faith. As a result, I started writing "treatises" about big topics, and Catholic "distinctives": points of controversy between Catholics and Protestants. I would produce these every few months: collecting all the information I could find, from my growing personal library, in order to explain Catholicism to my Protestant friends. After several of those, my Catholic friends suggested that I compile them into a book. I did so in 1994: a 750-page monster! I decided to shorten that and make it a more compact presentation, and this was my first book: A Biblical Defense of Catholicism: completed in May 1996. As usual with aspiring authors, I was rejected by several publishers (one of these later came to me and is now interested in publishing my books). Fed up with that, I self-published in 2001 and sold over 1600 copies in less than two years: simply from advertising on my website. But in 2003 I decided to make one last-ditch effort to solicit "official" Catholic publishers. The editor at Sophia Institute Press, Todd Aglialoro, took an interest in my work, and I signed a contract with Sophia for this book, which they published (only slightly modified) in the same year. It was followed by three more titles by 2009, and another (The Quotable Newman) is to appear by June 2012. I also wrote the apologetics inserts (uncredited!) for The Catholic Answer Bible in 2002. This was revised as The New Catholic Answer Bible (co-author, Dr. Paul Thigpen) in 2005. It is my best-selling book, but alas (often to my dismay), it was not a royalty contract. Also central (indeed, indispensable) to my career was my website, Biblical Evidence for Catholicism, begun in February 1997. Thirdly, I had several published articles from 1993 onwards, in The Catholic Answer, This Rock, Envoy Magazine, and a few other print publications, as well as being included in the conversion bestseller, Surprised by Truth (edited by Patrick Madrid) in 1994. I just wrote, wrote, and wrote, concentrating particularly on biblical indications of Catholicism, and debates with Protestants. By 2000 I already had well over 500 separate web pages and articles posted online. Now it is more than 2500, with still no end in sight. I've literally been writing Catholic apologetics constantly since 1996, and semi-regularly all the way back to late 1990. 3. What advice do you wish an apologist and writer had passed on to you early in your career, which you only learned through experience? I would urge anyone to not depend primarily on donations and promises of people (or even of congregations or parishes), in order to pursue an evangelistic and apologetics apostolate, and to never quit a full-time job (as I did) without something else in place. This was a primary reason for the collapse of my first full-time ministry as a Protestant. I was full of youthful idealism and my usual nonconformism, and was certain of my calling. I think the validity of the latter has subsequently been borne out by my success in getting published, and in much positive "testimony" feedback received. But I was far too naïve, in believing that evangelicals would "put their money where their mouth was," so to speak, without the coercion of begging and pleading with them for support: a thing I have always steadfastly refused to do. I was far too unrealistic as well; so I learned the hard way, and it was an extremely painful lesson and odyssey: my trial by fire. My resolve and faith was tested mightily. That's a good and very helpful thing in the long run, but not always fun when we are going through it. When I began my full-time Catholic apologist career, I had book royalties as a growing source of income, and also supported myself with additional jobs where necessary (including three years as a moderator on The Coming Home Network Internet forum). This is what I would tell anyone else: do your writing / apologetics part-time until you are absolutely sure (financially) that you are able to strike out and do the work full-time. If it's meant to be, it will be. I truly believe that, and have experienced it myself. In any event, it's extremely difficult to be a full-time Catholic apologist: especially without radio and television, affiliation with major organizations (like Catholic Answers), frequent strong solicitation of funds, or being on the lecture circuit. I've managed to barely do it without the help of almost all of those things (I've done a dozen or so radio appearances and have loose affiliations with many groups, mostly contractual). 4. Who were some of your biggest supporters and contributors to your early success? Apart from the encouragement of several friends, I am very grateful to Fr. Peter Stravinskas, whom I met at the Franciscan University of Steubenville in 1992, and gave some of my writings on Martin Luther. He took an interest in them, and as a result, I was published in his magazine, The Catholic Answer, in January 1993 (my first published article). Five more of my articles were later published in that periodical. Scott Hahn encouraged my work and said nice things, and wrote a Foreword in 2002 to my second book, More Biblical Evidence for Catholicism. Patrick Madrid: who accepted my conversion story for Surprised by Truth, played a key role. Marcus Grodi published several of my articles in The Coming Home Newsletter, starting in 1996. Above all, I am indebted to Fr. John A. Hardon, S. J. (Servant of God), who recommended my work (Foreword to A Biblical Defense of Catholicism). He was my mentor from the beginning, since I was attending his catechist classes even before I was a Catholic. 5. What were some of your favorite authors in your teen years who helped shape you? No one "shaped" me to any extent in those years (in a lasting way), since I had no interest in Christian theology at all till age 19. When I did start taking an interest, C. S. Lewis was the one writer who had a profound and lasting influence on me. He has been my favorite writer ever since, though possibly now tied with G. K. Chesterton. The most influential work of his in my life at this early stage, was Mere Christianity. 6. What does your writing process look like? Take us through the steps from idea to publishing? Rather than being a particular formal process, it's more of a motivation-driven thing for me. What I regard as my "secret" for the large amount of material I put out is my determination at most times to "follow my muse" (to use an analogy to music composers). I have the luxury of being able to write, for the most part, about whatever happens to interest me at any given time. Secondly, several of my books were drawn from efforts I initially undertook on my website: often as a result of challenges and subsequent debates. I respond readily to challenges, and find that they are a great stimulus and motivation to both think about and respond to issues raised. Later I tighten up and compile these efforts into books. Other projects are more of the nature of editing or organizing projects. My Chesterton and Newman quotations books were labors of love, that resulted from my desire to share with others the writers I love: who have taught me so much. Collecting quotes is an easy and enjoyable thing for me because I love to compile and organize (desires also suited for the task of a webmaster). The most difficult part in my case is the initial organization and outline, which I find tedious and even a bit stressful. Once that is done, I find it far easier to flesh out the idea of a book within the framework. I don't know why that is. 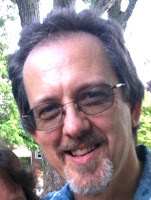 I liked writing my books, The Catholic Verses and The One-Minute Apologist a lot, because both were initially ideas originated by my editor, Todd Aglialoro. Thus, he came up with the initial outline: the part that I like least in the whole process. He was also immensely helpful in the organizational aspects of an upcoming book, 100 Biblical Arguments Against Sola Scriptura (Catholic Answers: 2012). Once the idea, goal, and outline is in place, it's simply a matter of my relentless drive for completion (flowing from perfectionism and being a self-starter) kicking in. Basically, then, it is a three-step process: 1) organize the framework, 2) allowing a free flow of ideas to occur, that come from previous study and reflection, and 3) the drive to finish the project. I don't have difficulty writing at all. I've never suffered from writer's block (thank heavens). It just flows (as fast as I can type), because ideas are in my head, and I seem to have no particular difficulty expressing them in words. Whether the results are worthwhile is, of course, for others to judge, but it's not a hard thing for me to do. I think it's a lot easier to write non-fiction. Coming up with a good work of fiction, on the other hand, is a whole different ballgame. I've never done that, but I can imagine the difficulties and challenges that one would run into: of a very different nature from theological non-fictional writing (character development, descriptiveness, plot, evoking images, psychological complexities, etc.). 7. What current projects are you working on or are in the back burner in some stage of development? I'd like to put together a new volume devoted to apologetic arguments for the Church (i.e., Catholic ecclesiology) and the papacy, drawn from many existing papers. This is one of an ongoing series of books devoted to one major theme or sub-category in Catholic apologetics. I'd also like to compile some historic (public domain) apologetics along the same lines. I am just about to commence this project. Another book likely in the works in the future (a publisher idea), is one devoted to the "hard sayings" of the Bible: including issues that atheists bring up: supposed contradictions, etc. Much of this will be drawn from existing papers as well, along with a lot of new, fresh material. 8. Which of your books is your favorite and why? The Quotable Newman, because of Cardinal Newman's huge personal influence on my conversion and my theological approach. I am very excited about sharing his superb thoughts with others, and I hope that this will become the "standard" Newman quotes book, and have a wide readership, including not just Catholics, but academics and theologians of all stripes, Anglicans, those who appreciate great English prose, and others beyond the usual Catholic apologetics niche market. Since I only edited that book, I'll also mention one of my own (self-penned) writings: The Catholic Verses. It's a favorite of mine because it reflects most closely what I have often done in my online dialogues: interacting with opposing views and doing a "compare and contrast" with Catholicism. I always like to have that "edge" provided by competing views and the challenges therein, in my writing. I love history of ideas, historical theology, comparative theology, and the art of the dialogue (especially Socratic dialogue). 9. Which of your books was the hardest to write and why? The One-Minute Apologist, by a wide margin, because it is very difficult to effectively condense complex and multi-faceted theological ideas into two pages and a standard Summa-like format, as I had to do in that book (and I am not known for brevity: to put it mildly!). Consequently, I am probably also proudest of this book, since I worked so hard on it. 10. Have you ever considered writing fiction? If so is it a project we might see in the near future? Not at all. I'm just not a fiction person. I don't read it, and certainly would never try to write it. The closest I come to fiction-writing is a series of Christmas poems and some fictional dialogues I have written, a la Plato and Peter Kreeft. I have nothing against fiction; it is strictly a personal preference of what I like the most. I think fiction is supremely important to building up and conveying a worldview and the most important things in life. People resonate with a story. I see this (I hasten to add!) as a "deficiency" in myself: not at all in the medium of fiction. I take in fiction by means of filmed drama. I'm a great fan of cinema. Given the choice, I love the dramatization more so than written descriptions: due, in part, to time considerations, and partly due to my reading relatively slowly. No. Do some writers do that? That's very interesting. When I am working on anything where I have to think a lot and be careful, I play no music at all. I usually only play it (and I'm a huge music collector and appreciator) when I am editing or doing tedious, time-consuming work of uploading a lot of necessary additions, and so forth. 12. If you could only recommend 10 books to a reader looking to be a well rounded and whole person what books would you suggest? Well, I have a "Desert Island Top Ten Catholic Books List" which is confined to theology and has no fiction, and isn't exactly what you ask, but it is close enough, and shows my own preferences. All of these have been hugely influential in my own life, and I think they are very important books, that would be of spiritual and educational benefit for anyone: though the Newman titles are quite "heavy" reading and not to everyone's taste. No particular order . . .
13. In many ways you are a modern renaissance man: philosopher, educator, researcher, student, author and more. Very few people today are as well rounded as you are. To what do you attribute this? I strongly disagree with that far too kind assessment (but thanks). I'm simply a lay "popularizer" (not a scholar) with a wide range of interests. Why do I have these interests? I don't know, except for (I think) a strong intellectual curiosity and drive to find truth wherever it leads. What ultimately causes even the desire for those things is a mystery, but it has to go back to God somehow. I passionately love the world of ideas, and in particular, history, theology, and philosophy. Ironically, in college, I majored in none of these (having majored in avocational music in high school), and chose sociology, because I was fascinated with the study of human beings and why they behave the way they do, but I have studied all quite a bit on my own. 14. I once had a university professor state that the true goal of a university education should be to teach one to learn how to think. What would you state should be the goal of higher education and why? His is close to my own view: how to think and analyze, and how to cultivate a critical mind, able to discern between good and bad arguments and logic, and truth and falsity. But beyond that (and beyond how most secular universities approach learning today), the Christian must also submit that learning is about truth and attaining to a complete, consistent worldview, which we think, of course, is Christianity. Truth and beauty are also objectively ascertained in things like science and the arts: things not directly theological. The true, the good, and the beautiful are the goals to be sought in any education. 15. Many of your books are available in ebook format. But with eBooks come the distribution of them through torrents and other illegal means; is this a concern for you, both as an author? There is not much I can do about it. I have to sell e-books in order to survive financially. I have added DRM protection to several recent ePub versions of my books that I have put together. But I haven't discovered anyone illegally selling or distributing my books. I think my audience realizes that I have to sell books to stay afloat, so I don't think many people are passing along my books and depriving me of sales. It's one of those mixed-blessing scenarios that new technology brings about. But we can never go back to pre-Internet days. It's too central to too many lives now. 16. Some authors monitor torrent sites and have their publishers contact them to remove their content. Do you do so or have someone do so for you? 17. 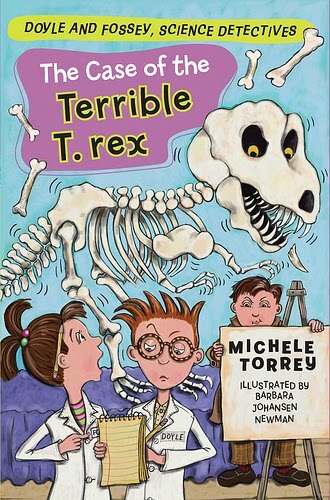 What were some of your favorite books and authors when you were younger? Well, again, this was a "pre-theological" period of my life. In those days (prior to 1977) I was interested in sports, biographies (I've always liked those), and books about mysteries: ESP, ghosts, telepathy, the "Chariots of the Gods" series, the Bermuda Triangle, the pyramids: things like that. I suppose my interest in the supernatural and the occult led me in some ways eventually into a serious Christianity: the more I learned about the latter. I had a curiosity about supernatural things (real or possible). That was the tie-in. I just needed to be properly taught about Christianity. 18. Who are some of your favorite authors to read now? The "big three" are Lewis, Chesterton, and Newman. I was privileged to be able to read many books and lots of letters from the last two, in preparation for my books of quotations. I am also very fond of Malcolm Muggeridge, St. Augustine, Peter Kreeft, Thomas Howard, Kierkegaard, Erasmus, Pascal, and Alvin Plantinga, along with many of the apologists (Catholic and Protestant) writing today. Honorable mention goes to a great book called The Gravedigger Files, by Os Guinness (1983). In the vein of Lewis's wonderful Screwtape Letters, this book by a brilliant evangelical thinker takes the concept of that classic one step further by applying a searing analysis to various pitfalls and shortcomings in modern Christianity, from a profoundly Christian and historically long-sighted sociological perspective (influenced a lot by the Lutheran sociologist Peter Berger). At the present time I am reading The Path Between the Seas: The Creation of the Panama Canal, 1870-1914, by David G. McCullough (1978). He's an excellent historical writer. I also enjoy reading music biographies (particularly about The Beatles): a complete diversion from my usual work. I'll appeal back to my answer for #12! But #1, beyond any of the books mentioned, has to be the Bible. I would suggest that they "follow their muse" and express their opinions and their art (as the case may be) in ways that can appeal to the culture they primarily write to, without compromising their faith. This was the recommendation of Vatican II and the example of St. Paul's evangelistic methodology on Mars Hill in Athens (finding common ground with his hearers) and advice of "I have become all things to all men so that I might by any means save some of them" almost 2000 years ago. Our task is to make old truths fresh and appealing. Christian truth is just as true now as it has ever been. Being "old" does not detract from that at all. "Chronological snobbery" (C. S. Lewis's delightful term) is a lie. Nor does Christian writing and art have to be explicitly theological or "preachy" in order to be profound and reflective of Christianity. All truth is God's truth: as the proverb says. Tolkien's Lord of the Rings is suffused with Christianity throughout, while never mentioning it at all (as such). Beauty is an objective thing, grounded in God. Our task is to use to the best of our ability, the talents granted to us by God's grace and design. I try to keep in mind the "three E's" in my writing, and would urge others to, also: our writing as Christians ought to be "entertaining, edifying, and educational": appealing and pleasing respectively to the heart, soul, and mind. David thank you for taking some time to answer the question sand with such depth and insight. Check out is page of books available and his current special on 15 books as an eBook deal you cannot beat the price. "The Catholic Mary": Quite Contrary to the Bible? 501 Biblical Arguments Against Sola Scriptura: Is the Bible the Only Infallible Authority? Biblical Catholic Salvation: "Faith Working Through Love"
Science and Christianity: Close Partners or Mortal Enemies? 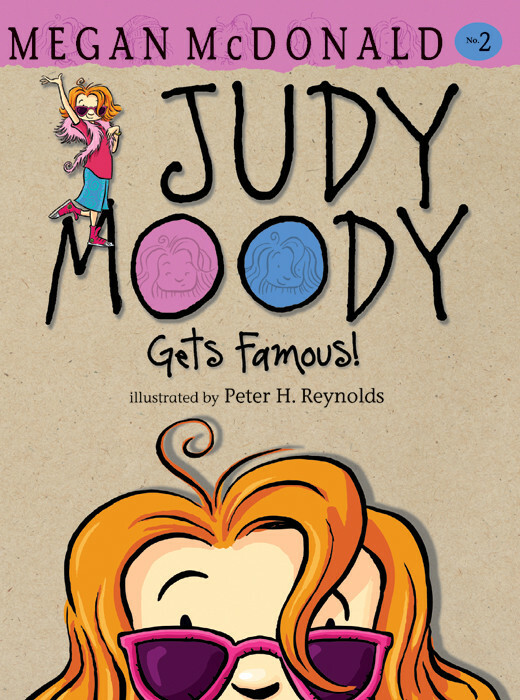 Judy Moody is a young girl that easily gets in a mood. When she is in a mood it is not unusual for her to ROAR at people or just out loud. 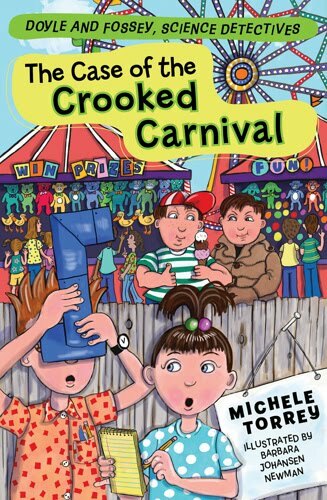 She is a wonderful character to read and her books are great fun for the young and young at heart. 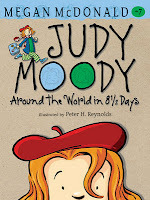 And with over 20 books in the Stink and Judy Moody series she is a very popular young girl. Her books have been translated and are enjoyed around the world. With every book I read, I enjoy the writing by Megan McDonald and the Artwork by Peter H. Reynolds even more. Because I have not been reading them in order, it was interesting to go back to this one and see illustrations of Stink before his own line of books started, to see the evolution of Stink as it is. This was another wonderfully entertaining story in a magnificent series! How Do You Spell Famous? In this adventure Judy Moody wants to get famous. One of the girls at school has been in the paper and won a tiara, and after asking around, Judy finds out her mother has been in the paper, her little brother, and even both of her best friends. ROAR! 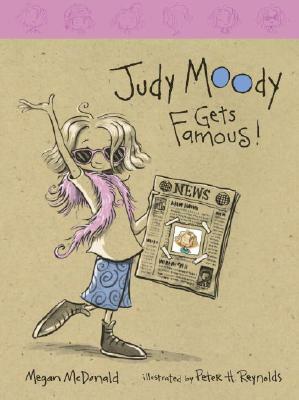 Judy tries a number of ways to get famous but either ends up infamous, or cropped out or misspelled. Then she has an idea to do something for other people and though no one knows it was her, she finds her one reward. Again this was a great read and all of the books in the series are worth reading. Give them a try. You will smile, and laugh and maybe it will help you not be in a mood!